As much a book review as a book club assessment. Put a seafaring image on the front cover, talk of adventure and exploration, make reference to ghosts… I’m sold. We read Sandler’s “epic search for the Northwest Passage” for the Half Price Books Humble Book Club and discussed it the first Monday of December. It’s an exciting read, I enjoyed it quite a bit, and I’ll be holding onto my hardback copy for years to come. I’d love to see this made into a film, as it was I found myself re-watching National Treasure: Book of Secrets just for the Resolute references I was craving post reading. One comparison would be the personal pride exhibited by the people across all 3 books [A Tree Grows in Brooklyn, A Question of Upbringing, and Resolute]. 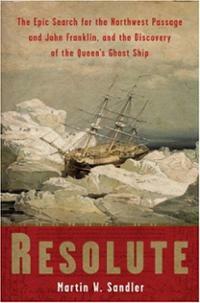 In Resolute, the British Naval captains were too arrogant to ask the Inuits how to survive in a place they have never been. And the title ‘A Question of Upbringing’ speaks for itself. We carry much of our discussions over into later months and often end up talking about books we love repeatedly. There aren’t many of us. Two in person on the regular, one by phone on the regular, and various stragglers that pop in periodically (3 recurring stragglers, to be exact). But we enjoy our talks thoroughly and are always hopeful of new members. Like the worldwide search for John Franklin, our little club keeps on keeping on. I think we’re a pretty well rounded, well read group. 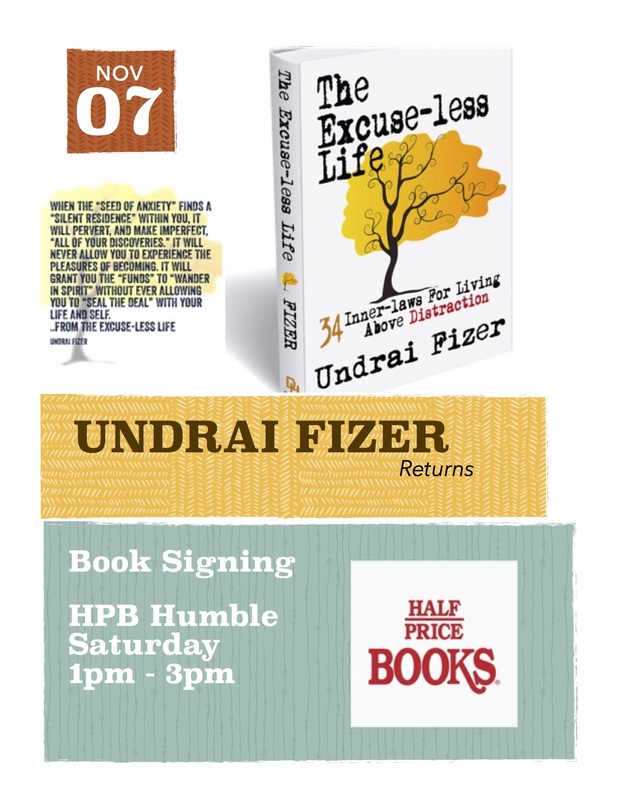 If you’d like to join us, we meet at Half Price Books Humble the first Monday of every month at 7:30 pm. Year round. If you want to discuss something we’ve already read, something we’re currently reading, or something else altogether – that’s fine, we’ll chat. One of the coolest things I get to do as a part time Event Coordinator, is host parties! And not the sit in someone’s living room and sell products parties – but the kind that involve books, exciting authors, food, live music, and art. 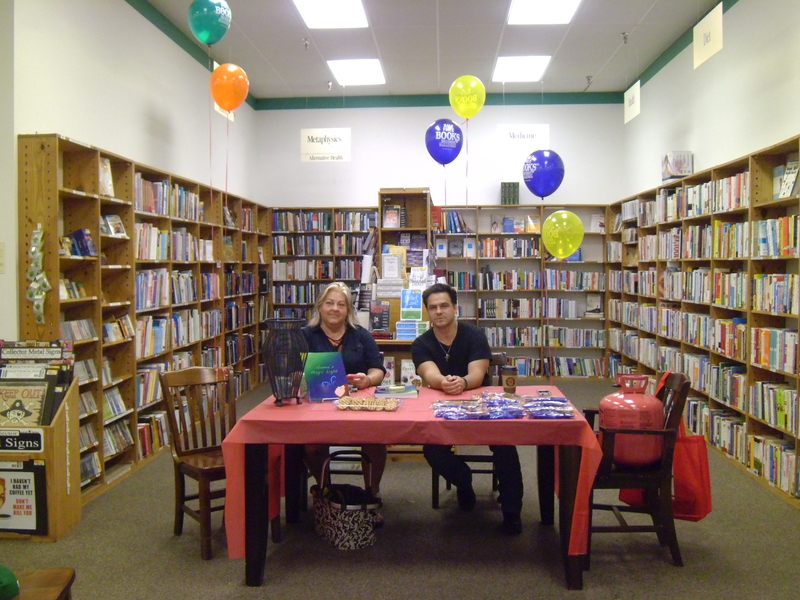 As of September 2014, Half Price Books has had an Humble location for 12 years. This is the third birthday/anniversary celebration I’ve organized for them. 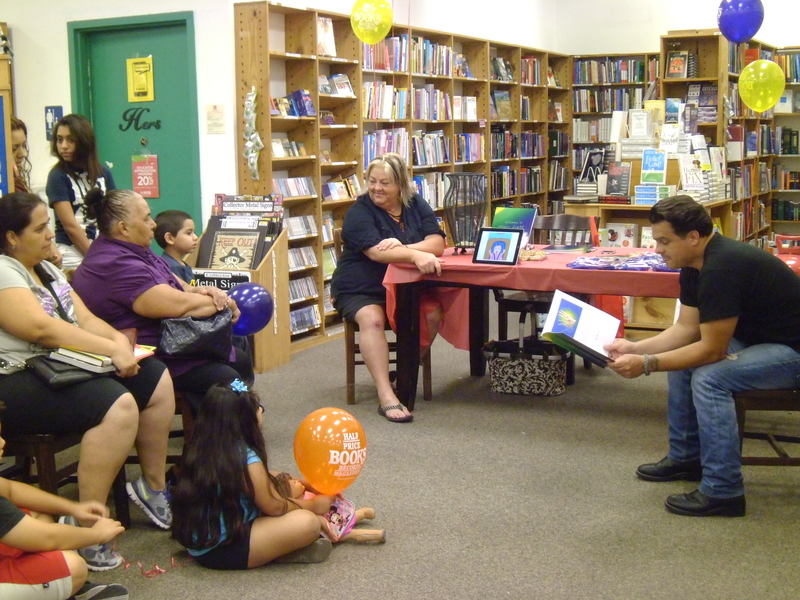 Edward draws a crowd while reading his book Hanna’s Magic Light and passing out goodie bags and cookies. 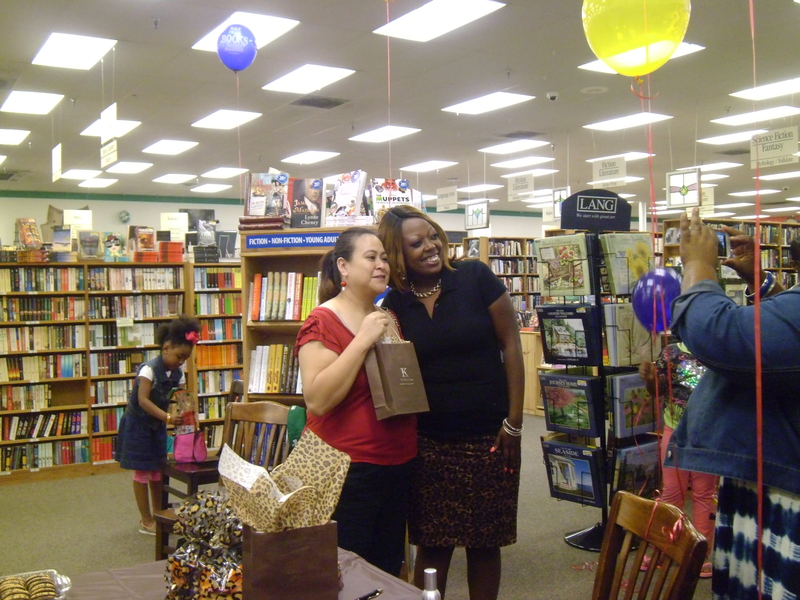 Author Kaiya Walker and fan. 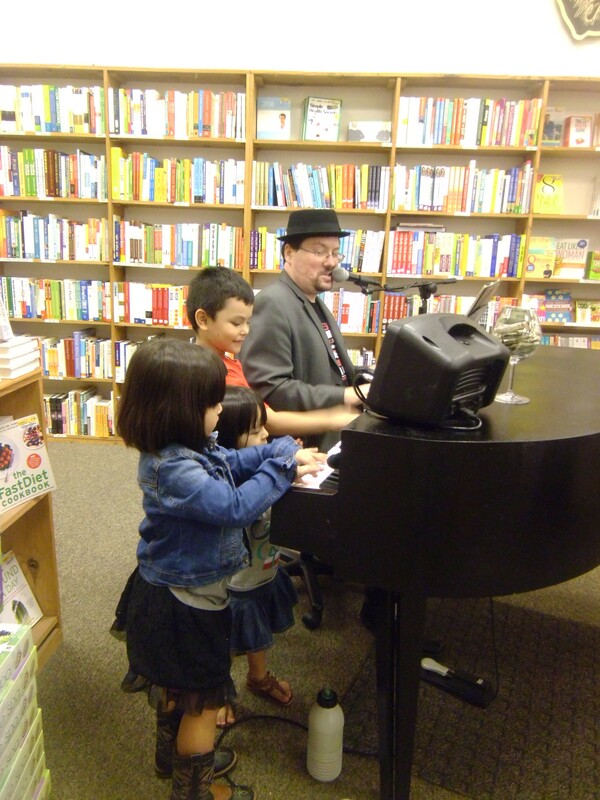 George Poe jammin’ on the piano with some curious kids. 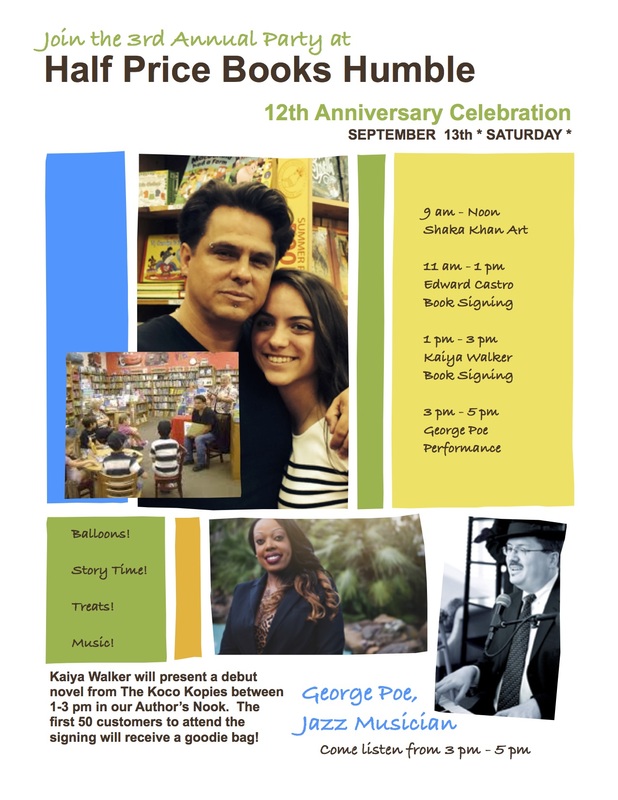 This next Saturday, I’ll be at the 2nd Annual Good Books in the Woods Fall Festival (September 20th), it should be equally awesome. 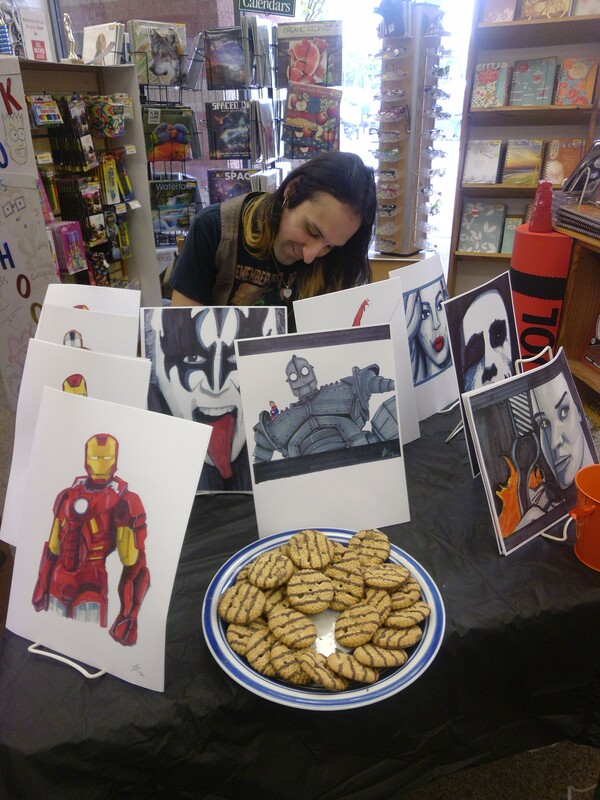 I love bookstore events, they are my favorite way to spend a Saturday afternoon. As a homeschool mom, a story time host, and a book blogger, I can’t just can’t get enough of Schiffer books. They are educational, riveting to crowds, and just plain gorgeous. Recently we read, reviewed, and enjoyed Song for Papa Crow. 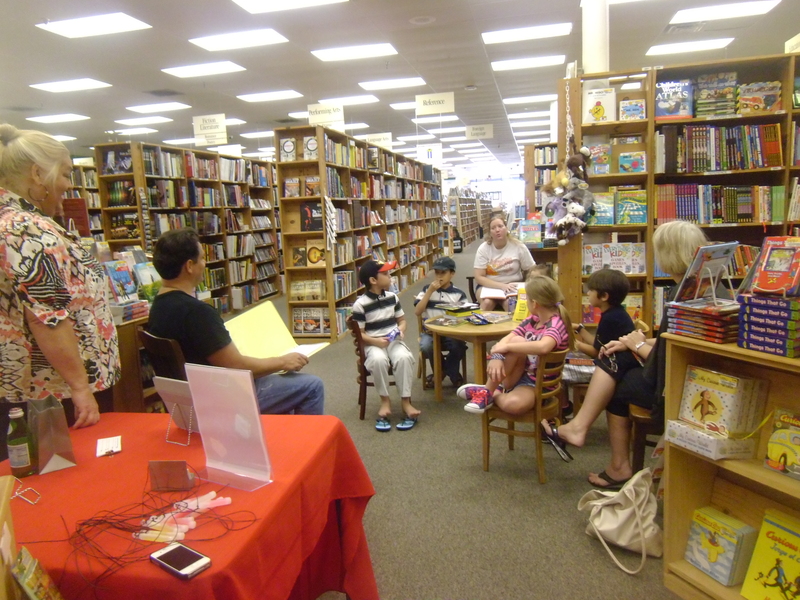 We even got to interview the author! 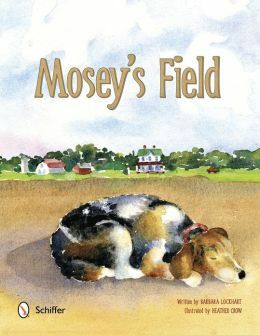 This week, we’ve been blessed with a copy of Mosey’s Field and the kiddos today loved it. We read it twice and no one who had sat through the first reading complained or got antsy. It’s not surprising to discover that both the illustrator and the author of this book are teachers. Barbara Lockhart is a retired kindergarten teacher and Heather Crow is a teacher and freelance artist. Kids respond well to the story, want to follow the adventures of Mosey, love the illustrations, and know a little bit more about where food comes from by the time they are done hearing the story. Designed for booklovers ages 0-6, it is a lengthier picture book and you’ll want to be aware of your audience’s attention spans before you tackle it. Great for kids who are used to being read to, if you’re just introducing your child to the world of books I’d start with a few shorter titles with the intention of working up to this. 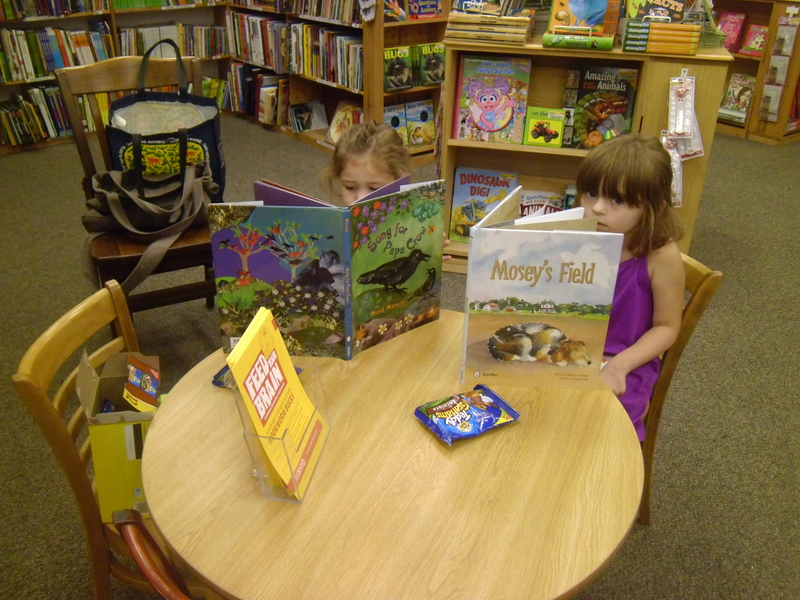 Our kiddos at the bookstore today did great! At one point in the story Mosey is on the opposite side of the corn field, near town, away from home. Mosey can’t see home and the family is out wondering where their pup has gone. My kiddo in particular was very relieved by the ending and asked me to tell the author that she’s “glad Mosey found his family” but will have you know that page 22 was a moment of great contention in her little soul. 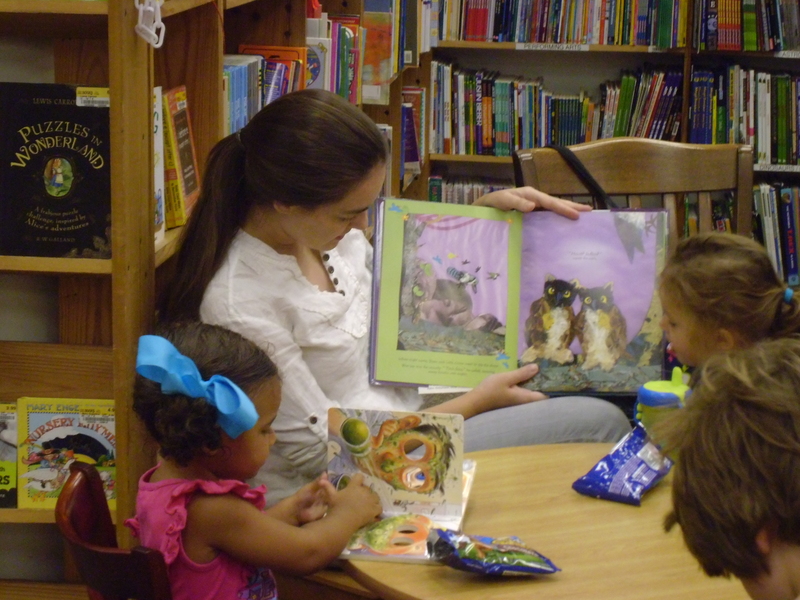 If you’re in the Humble area, join us at Half Price Books for story time on Wednesdays, 10:30 am. 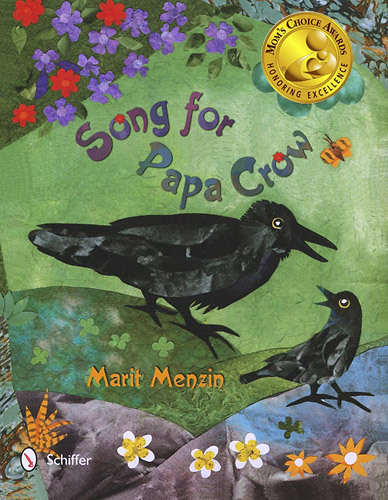 To the right we are reading Marit Menzen’s Song for Papa Crow, which has become quite a household and store favorite. Join us next week and we’ll revisit Mosey’s Field. 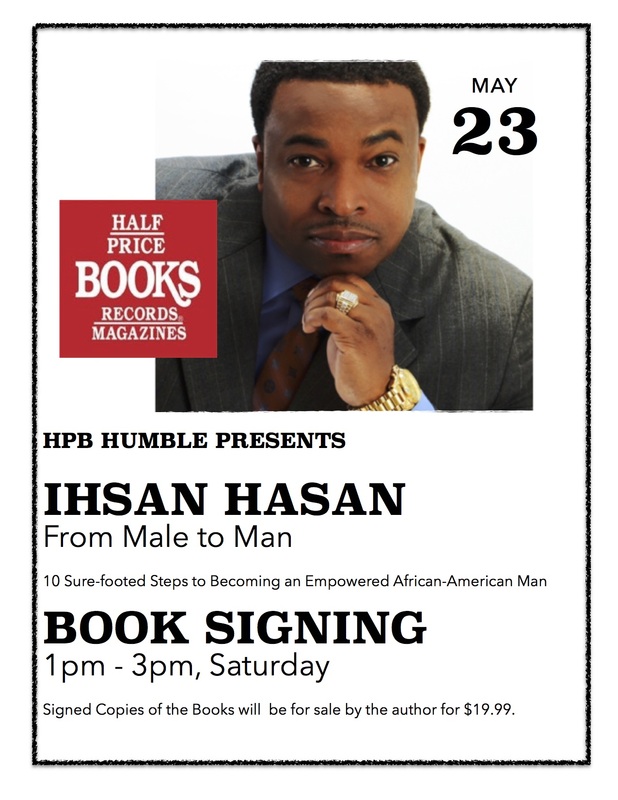 Every Wednesday during the summer I make an appearance at Half Price Books Humble, 10:30 am sharp. I make an announcement over the intercom – NOT my forte – place snacks on the children’s table, and pick out stories to read out loud to whoever arrives. Sometimes I have crowds! Sometimes it’s just me and Kiddo hanging out reading as we would at home. 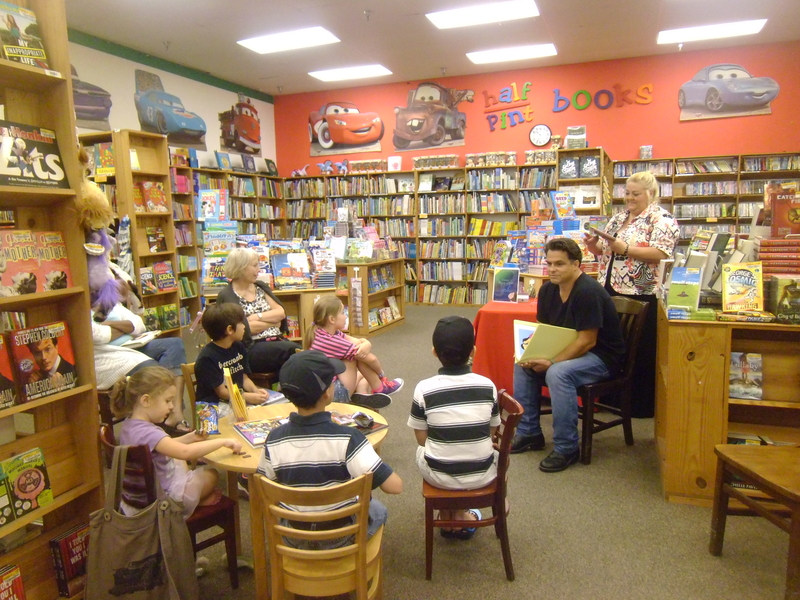 Sometimes I have authors come and read their books to the kids. But ALWAYS it is a little bit magical. 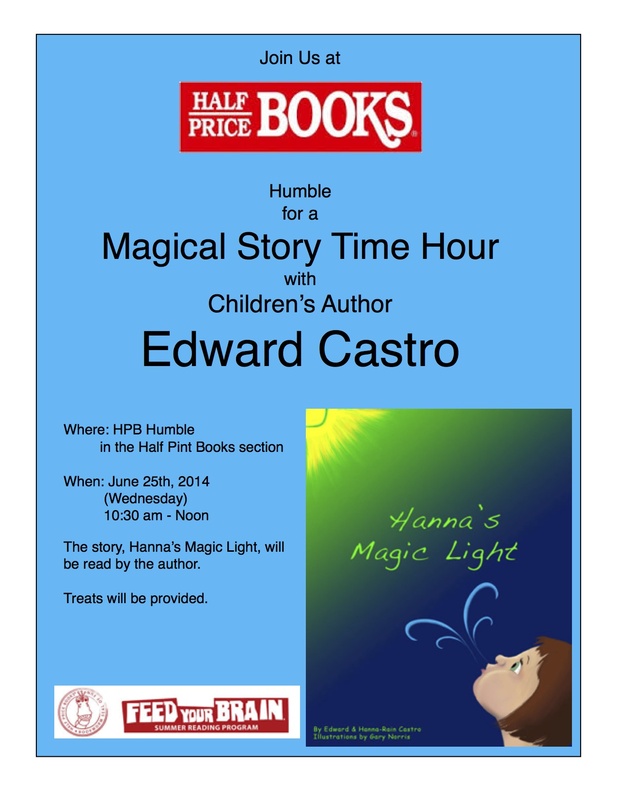 How appropriate then that Edward Castro joined us for a second time with his book Hanna’s Magic Light . 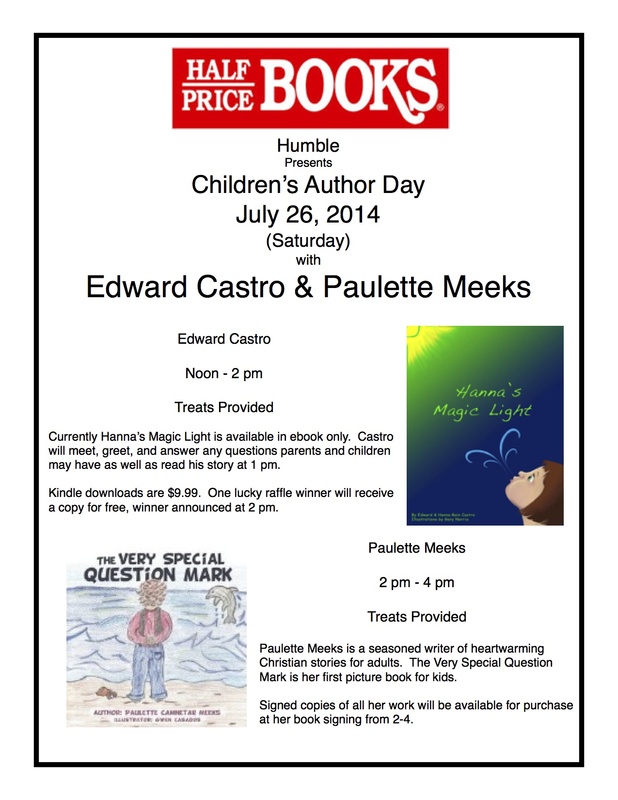 Not available yet in a physical copy, Castro read to the kids from a bound manuscript while his agent showed the pictures on her tablet. The kids were riveted by the story about Hanna and her Daddy and the magical dome light in the car, turned lesson on finding your own inner light. At the end, each kid received a cupcake and/or cookie as well as a “magic light” of their own to take home – Glow Sticks made into a necklace. Tomorrow is Wednesday again. We won’t have Castro back this soon, but we will be featuring Song for Papa Crow, compliments of Schiffer Publishing. 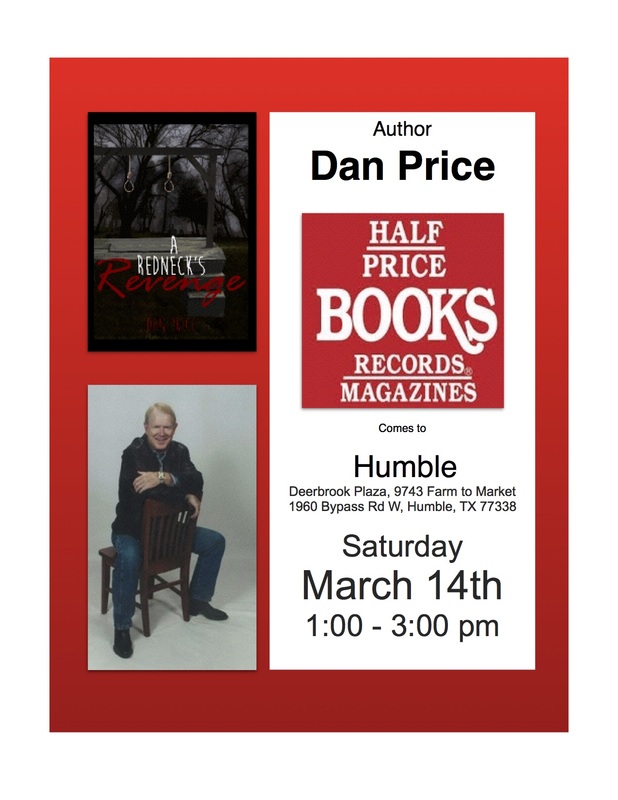 This Wednesday at Half Price Books!